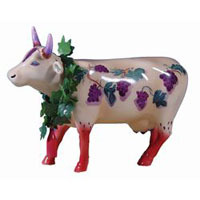 Fine Wine Bovine | CowParade New Figurines | One Price Low Flat Shipping! From the CowParade Retired Collection, Fine Wine Bovine. Designed by artist, Sharon King. Featured at the CowParade Las Vegas 2002 exhibit. Made of ceramic. Measures 4" x 6". Mew in original box. This delightful cow figurine is great kitchen decor! It features a vine with grapes on it, a leafy wreath, and a wine bottle hanging from its neck. The hooves are painted a cabernet color to blend in just right!